We can point to at least three trends that are helping to push assets under management and revenue to records, Barry Ritholtz says. As always, the consulting firm’s annual report on global asset management is a dry, number-laden and utterly fascinating look at the business of overseeing money. Ignore the boring title, “Global Asset Management 2014: Steering the Course to Growth” and instead focus on the cold, hard dollars. They are enormous, beyond big. In 2013, managed assets rose to a record $68.7 trillion. This year is on pace to see a further increase. Before the financial crisis in 2007, total assets were $54.7 trillion. Considering all that has occurred in the intervening years, the asset management business looks quite healthy. Check the following chart: Net revenue rose 11 percent, edging past the 2007 total. Profit rose as well, to $93 billion, a 17 percent gain from 2012, though still lower than the $100 billion of 2007. 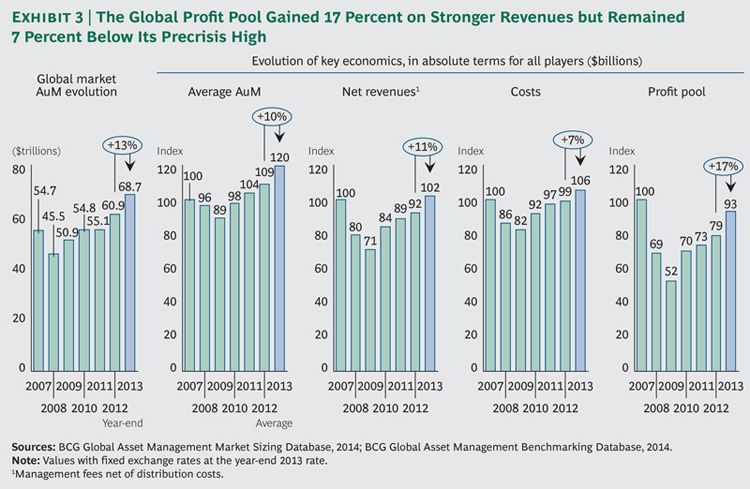 Asset management is among the world’s most profitable industries, according to the data. Operating margin, or profit as a percent of net revenue, rose to 39% percent last year from 37 percent the year before. That’s impressive, though it doesn’t quite match the 41 percent margin reached in 2005 through 2007. Hence, based on earnings of $93 million and a profit margin of 39 percent, my back-of-the-envelope calculations suggest industry revenue of $238 billion. This explains the big salaries and even bigger bonuses. These are impressive numbers. But the recovery of the financial industry, and indeed, its expanding prosperity, is a much more complex and deeper story than the numbers suggest. We can point to at least three trends that are helping to push assets under management and revenue to records. First, we begin with the bailouts. Had central bankers and politicians let capitalism run its natural course, the financial landscape would very likely look very different from today. I imagine there would be more competition, less concentration of financial power and fewer gigantic money-center banks. The results of what would have been an epic Darwinian struggle during and after the financial crisis are hard to imagine in great detail. Almost $1 trillion in cheap loans to bail out the banks instead of letting them collapse into bankruptcy isn’t how Adam Smith envisioned the workings of the marketplace. Next, we move to, well, more free money. Central banks around the world have set the cost of funding at close to zero. The mechanisms that central banks use flow directly to the world’s corporations. Companies can readily access credit in order to buy back shares, issue dividends or (heaven forbid!) do some capital investment and hiring. It should come as no surprise that the actions of Federal Reserve, the European Central Bank and the Bank of Japan haven’t exactly worked to the detriment of financial centers such as New York, London and Hong Kong. Third — and don’t underestimate the significance of this — corporate profits have dramatically recovered. They have more than doubled from the lows of the financial crisis. This has had a huge impact on stock prices in several ways. It made the aforementioned share buybacks much more feasible. As Bloomberg News reported yesterday, Standard & Poor’s 500 Index companies are “poised to spend $914 billion on share buybacks and dividends this year, or about 95 percent of earnings.” That is an astonishing data point. Estimates vary, but increased dividends and share repurchases are credited with being responsible for anywhere from 30 percent to 60 percent of stock-price gains. Finally, I would be remiss if I failed to mention various trends in asset management fees. A variety of robo-advisers have driven costs way down. Wealthfront, Betterment and Liftoff (my humble offering in this space) charge a fraction of traditional wealth-management firms. Although these services have garnered lots of headlines, they manage a paltry $3 billion in assets. Meanwhile, hedge funds are now overseeing $3 trillion and charging the proverbial 2 & 20. Private equity and venture capital are also charging fees that include 2 percent of the annual assets under management and 20 percent of any gains. Fees may be going down at the low end of the spectrum, but they remain surprisingly strong at the high end. If you imagined the financial crisis was going to cut the financial industry down to size, you haven’t been paying close attention.